PIT volunteers working on Phase One of the McKenzie House Stabilization Project. Join us on the Salmon-Challis National Forest again this year as we take on “Phase Two” of the stabilization efforts at McKenzie House! McKenzie House was built in the 1880s and, in its prime, was considered among the finest houses in Custer, a once bustling boom-town that sprang-up on a terrace of the Yankee Fork Salmon River in 1879, after gold was discovered in the area. The now ghost town includes a schoolhouse, a saloon, nine residences, two stone houses (ruins) and several outbuildings. 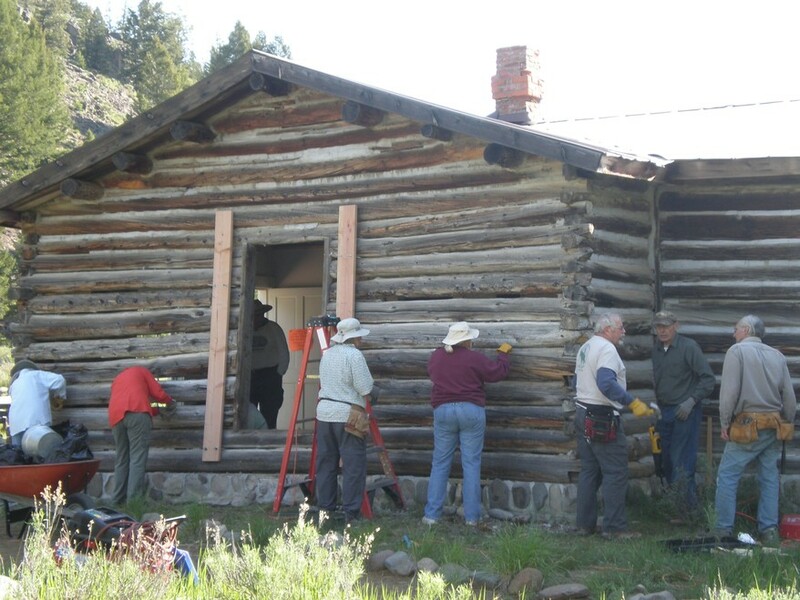 It is listed on the National Register of Historic Places (NRHP), and The Yankee Fork Interpretive Association has partnered with the Salmon-Challis National Forest to provide interpretive services and caretaking at the town. Unfortunately, McKenzie house – an obvious focal point of the town – is still in danger of failing, and the historic gem once again desperately needs your help to attain its’ former glory! Phase One of the project was successfully completed in 2016, and consisted of stabilizing the structure to prevent further damage and collapse. This year, during Phase Two, we will rebuild a section of the wall using existing and replacement logs, treat the logs to prevent decay, and re-chink/re-daub the building. The annual Custer Days celebration, during the second week of July, draws hundreds of visitors each year, and we hope to give them a glimpse of what this magnificent house and its surrounds may have looked like in its heyday. See you in June for an exciting week-long project in the heart of a 19th-century ghost town!